Imagine finding a huge smiley face on a hillside in Oregon? That’s exactly what happened. So you’re driving to the Oregon coast on your way to Lincoln City on highway 18 and you’re passing through Sheridan, then Willamina just about to reach Grand Ronde and the casino when you look South off the highway taking in the amazing Oregon scenery. There high atop a hill to your left, you spot a giant smiley face peering through the forest on the mountain. Could it be real? 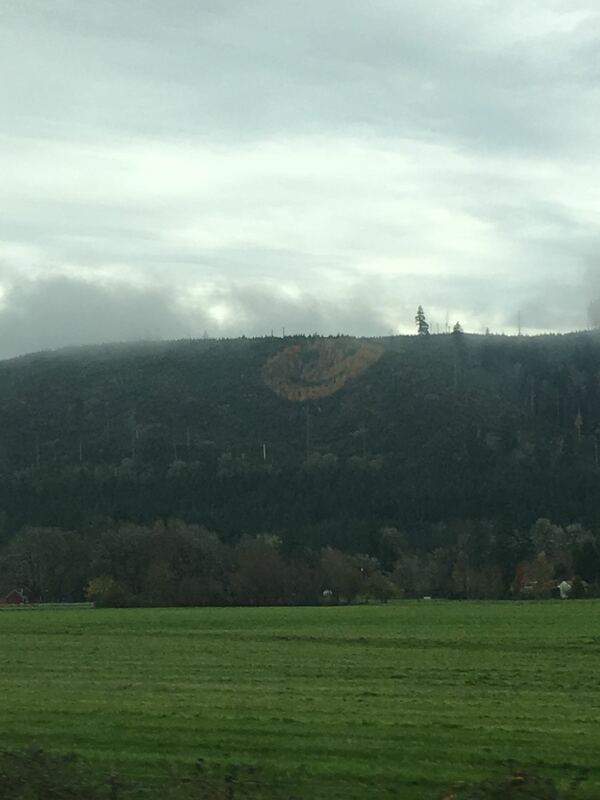 Who created a big smiley face out of trees in Oregon? Recently while heading to Lincoln City along Hwy 18 we noticed something peculiar on a hillside between Willamina and the Grand Ronde casino. We couldn’t believe our eyes. There was an actual enormous smiley face on the side of the hill and it was clear that it was no accident. We just couldn’t help ourselves. We pulled off and did our best to find a way to get close to it and capture some video to share. Here’s some of our video of the smiley face on the hillside outside of Willamina in the Grand Ronde area. We decided to dig in and do some investigation on this crazy smiley face and figure out who and what’s behind it’s awesomeness. Our investigation led us to believe that the site is owned by Hampton Lumber. Of course we didn’t stop there. We wanted to get the details, so we reached out to the company in an attempt to get more information. Though our first few calls failed at connecting with anyone that could help us, we kept trying. Eventually making contact with Kristin at the company. She was really helpful and got us some answers to our questions about the smiley. When it was the smiley created? How was the Willamina Smiley Face planned and executed? They used a rope to measure the circle out and the eyes and mouth were triangulated from that point. Douglas fir was planted for the eyes and mouth and the rest of the face was filled out with larch. Both species will eventually be turned into lumber at our sawmills in Willamina and Tillamook. The story behind why the Oregon Smiley was created? After harvest, our foresters design and implement plans to ensure regrowth of a healthy forest. Depending on the location and environment, seedlings of several different tree species are often planted. The idea for the smiley face started with David Hampton and our former timberland manager, Dennis Creel. When we harvested the site, we knew the area was highly visible to people travelling down highway 18 so David and Dennis saw an opportunity to have a little fun. How long it take to create the huge hillside hwy 18 smiley face? Let’s just say smiley face designs are not the most efficient reforestation methods out there. With planning and planting it took about a week to finish. Any funny or interesting things/responses that have happened because of it being there? Most people who pass by have no idea how it got there or who put it there but we see a lot of people stop to take photos each fall. How long will the huge hillside smiley face last naturally? This is the first time we’ve done something like this so we’re not really sure how the face will change over time. The face will certainly “age” as the trees grow, but it’s probably safe to say the effect will last for another 10 years or so. Any plans for anything else fun like this in the future? Believe it or not, the comforting smile and “have a nice day” didn’t originate in our beloved Portland. It also didn’t begin as depicted in the famous film Forrest Gump. In fact, the iconic smiley face story began all the way across the country in Worcester, Massachusetts in 1963, by a man named Harvey Ball at a company called Worcester Mutual Insurance Company. In an effort to boost company morale, they created smile buttons for something called the “smile campaign”. From there, the story has many twists and turns that all lead up to what we now simply call the smiley face. From it’s humble beginnings, the smiley face became an iconic symbol easily recognized on the side of a hill some 50 years later in Oregon. It’s amazing how things come together isn’t it? The Oregon hillside smiley face is just about an hour from downtown Portland and worth a Sunday drive. Who knows, maybe a stop at the casino afterwards could make the trip even more fun. Either way, it’s definitely a Portland “must do” item to add to your list.